6. 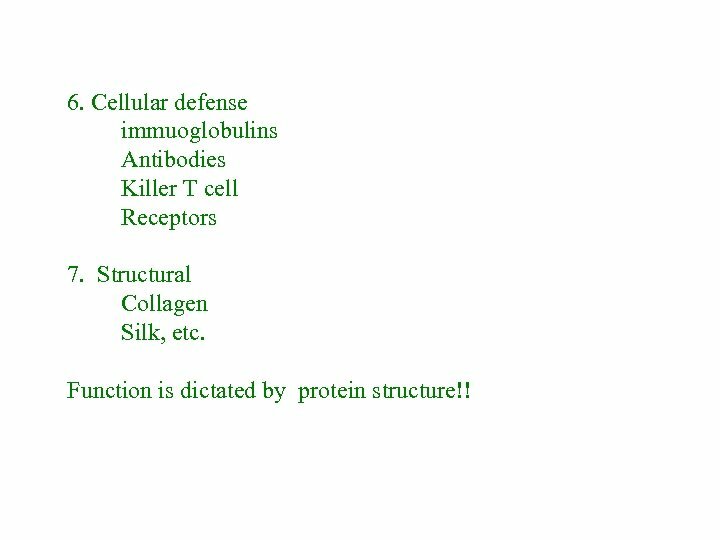 Cellular defense immuoglobulins Antibodies Killer T cell Receptors 7. Structural Collagen Silk, etc. 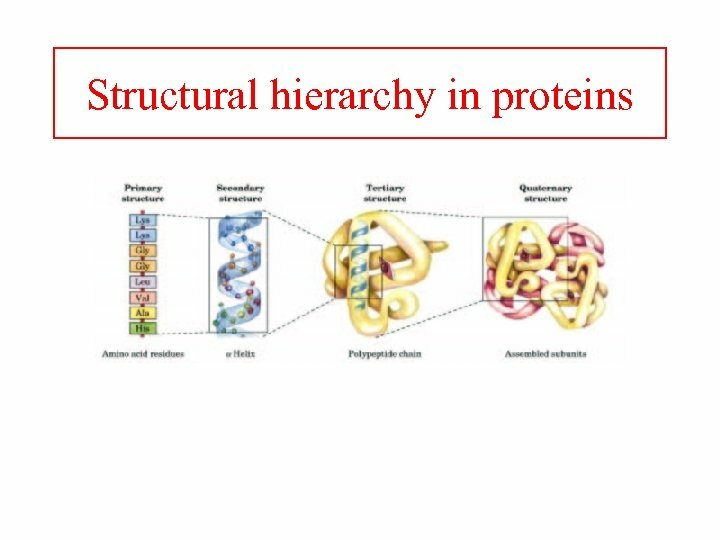 Function is dictated by protein structure!! 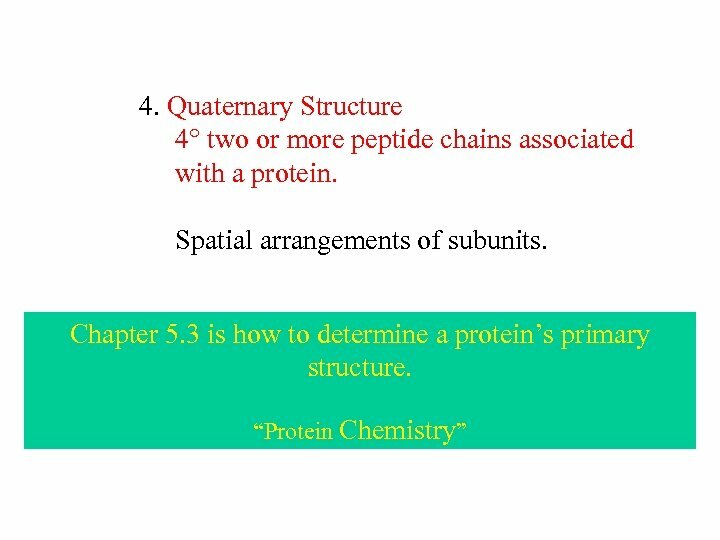 There are four levels of protein structure 1. 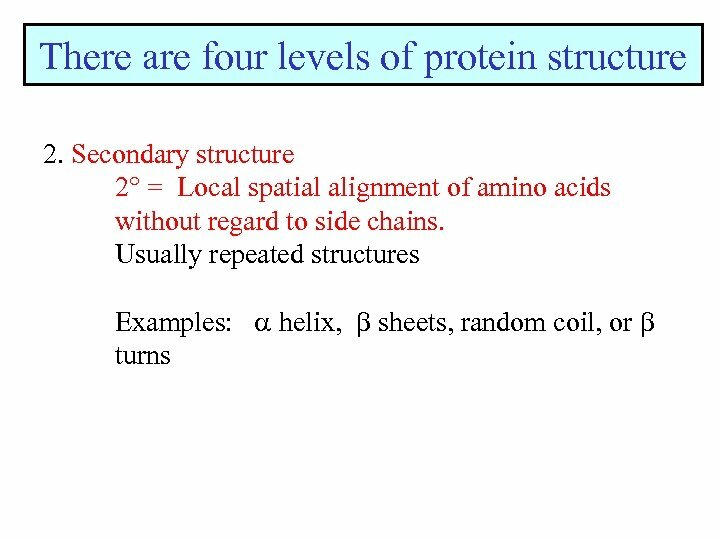 Primary structure 1 = Amino acid sequence, the linear order of AA’s. 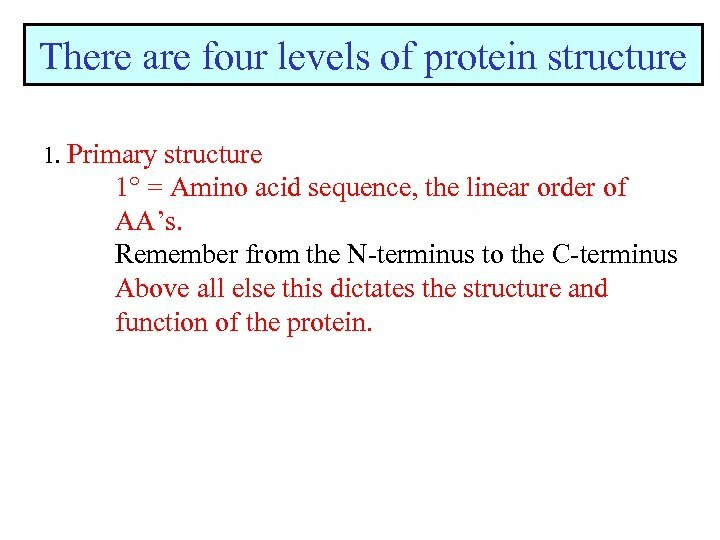 Remember from the N-terminus to the C-terminus Above all else this dictates the structure and function of the protein. 3. 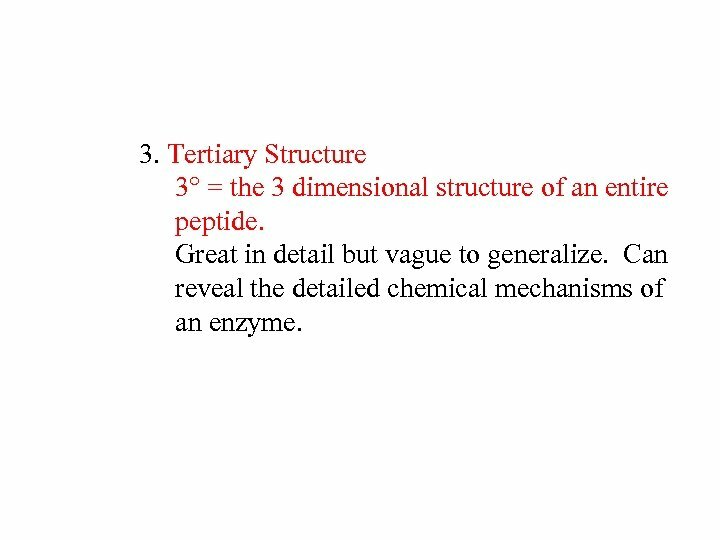 Tertiary Structure 3 = the 3 dimensional structure of an entire peptide. Great in detail but vague to generalize. Can reveal the detailed chemical mechanisms of an enzyme. 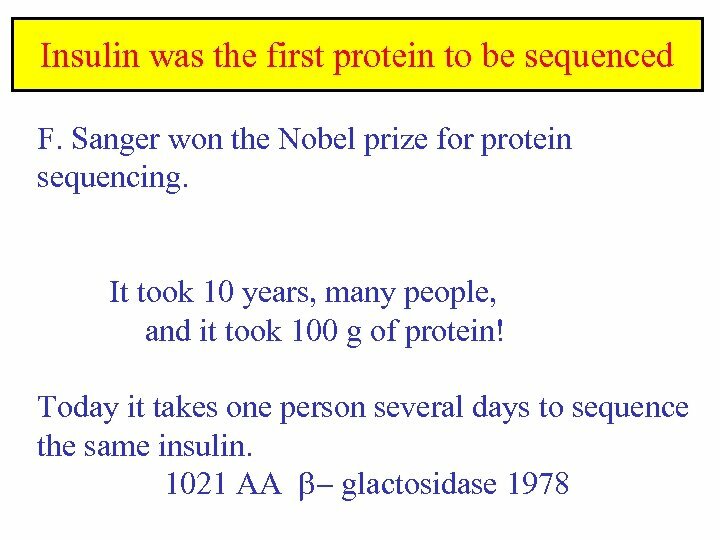 Steps towards protein sequencing Above all else, purify it first!! Chapter 5. 3 then 5. 1 and 5. 2 1. Prepare protein for sequencing a. 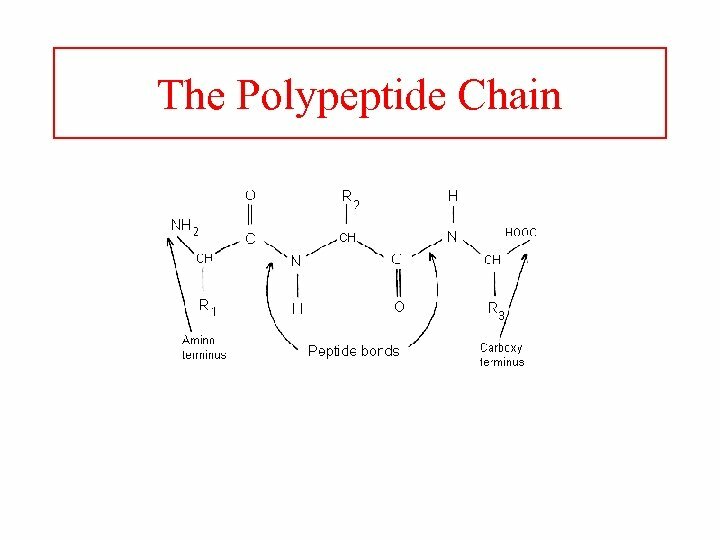 Determine number of chemically different polypeptides. 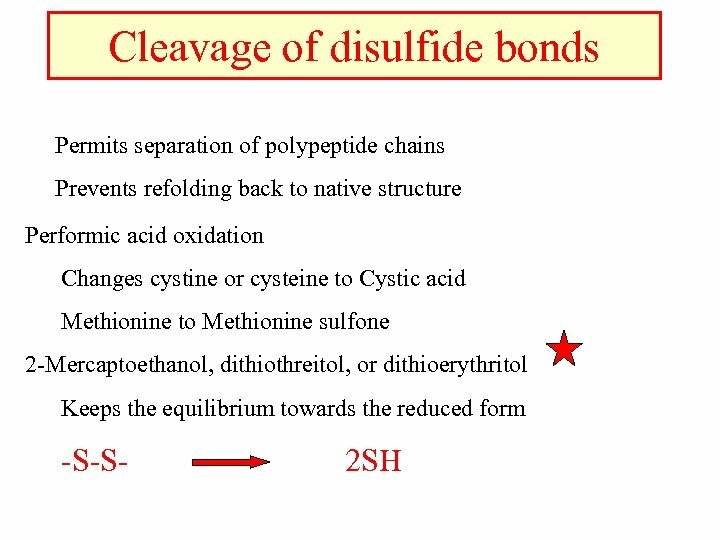 b. Cleave the protein’s disulfide bonds. c. Separate and purify each subunit. 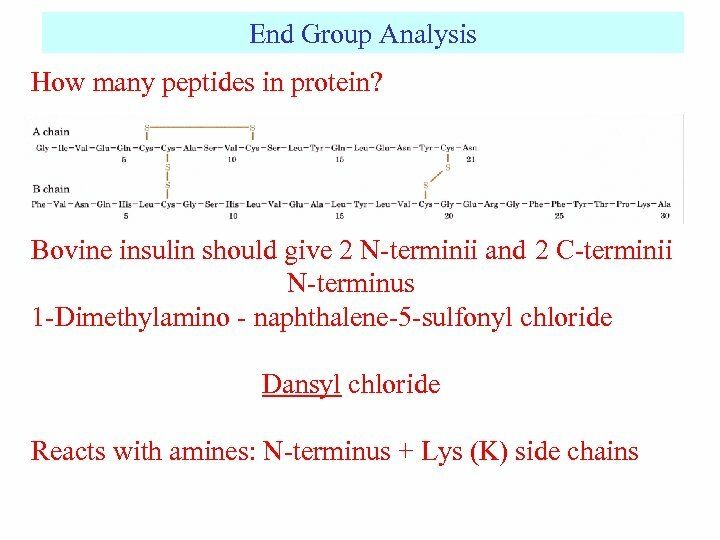 d. Determine amino acid composition for each peptide. 2. 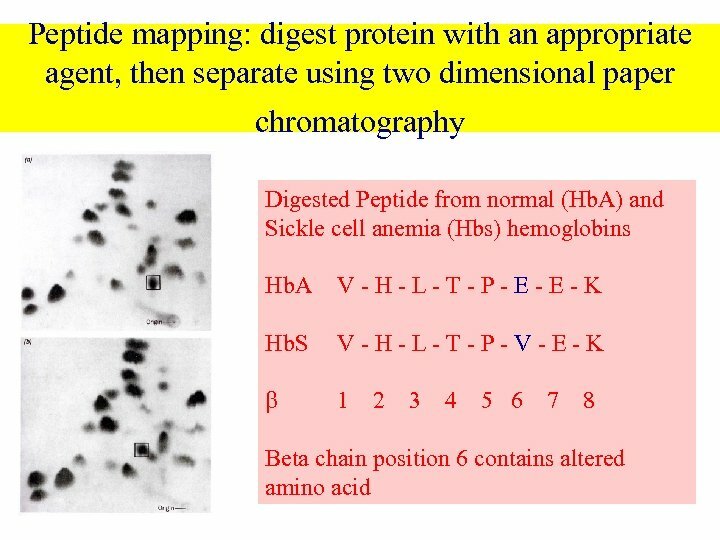 Sequencing the peptide chains: a. Fragment subunits into smaller peptides 50 AA’s in length. b. 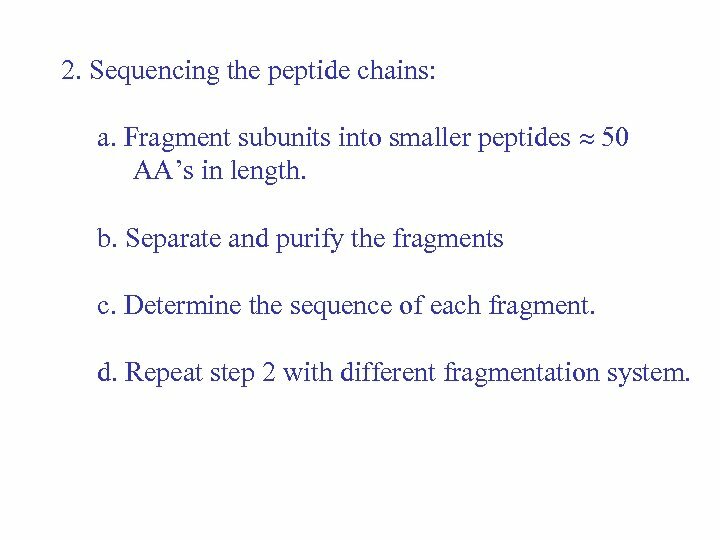 Separate and purify the fragments c. Determine the sequence of each fragment. d. Repeat step 2 with different fragmentation system. 3. Organize the completed structure. 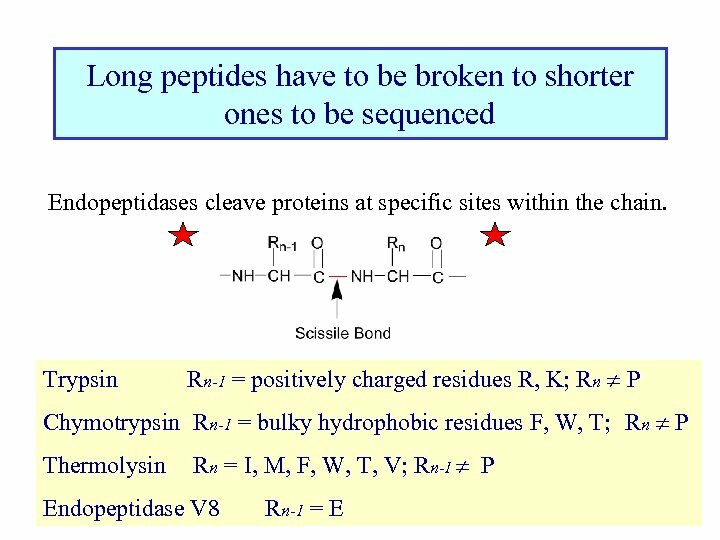 a. Span cleavage points between sets of peptides determined by each peptide sequence. 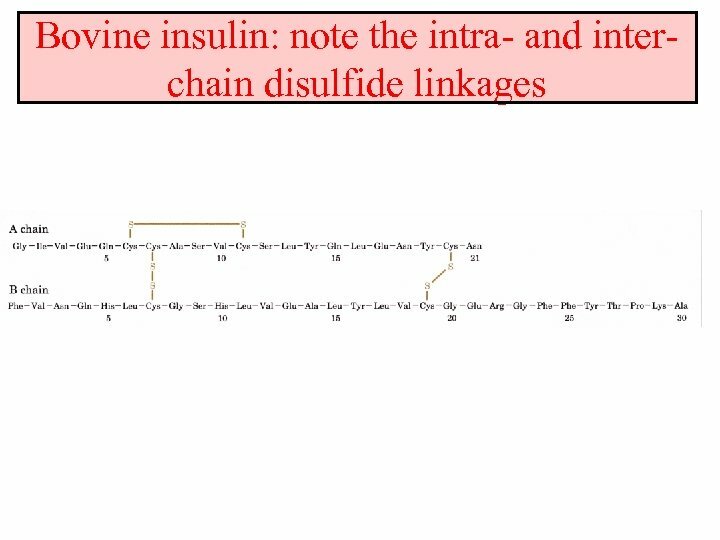 b. Elucidate disulfide bonds and modified amino acids. 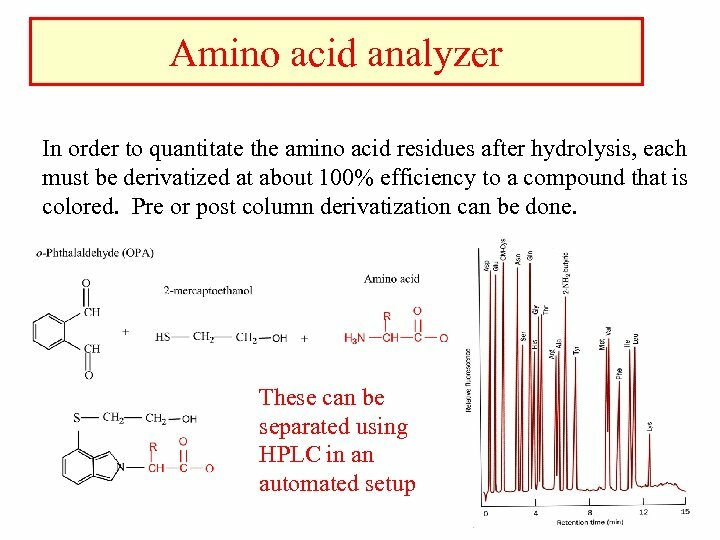 At best, the automated instruments can sequence about 50 amino acids in one run! 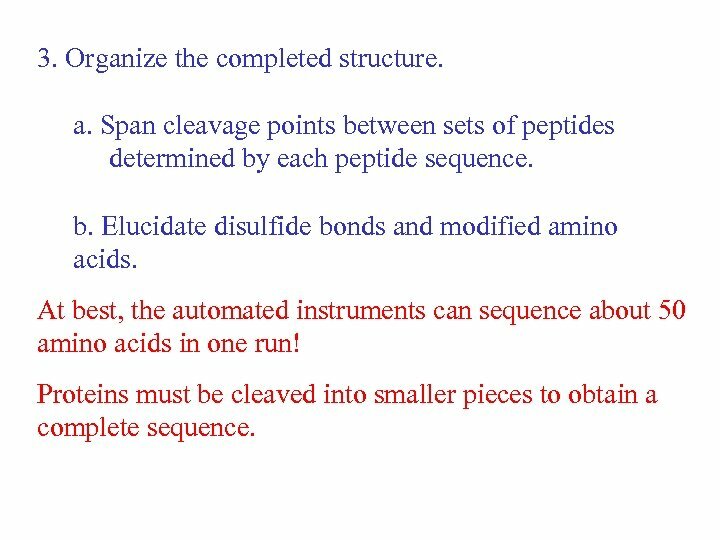 Proteins must be cleaved into smaller pieces to obtain a complete sequence. Edman degradation has been automated as a method to sequence proteins. 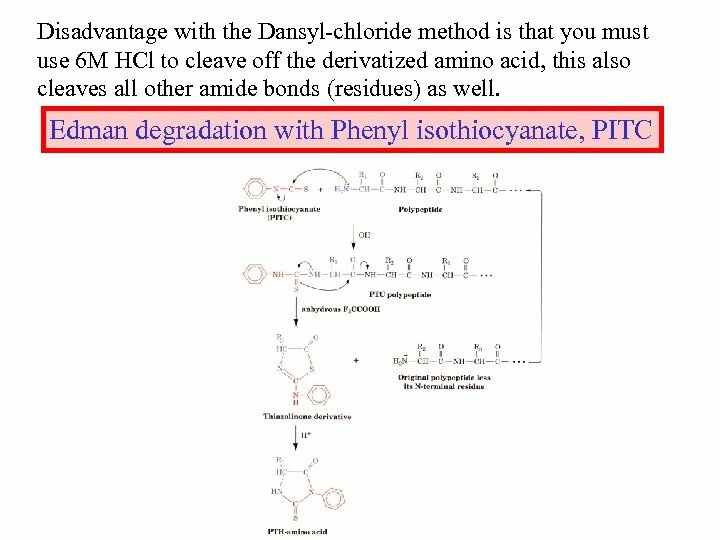 The PTH-amino acid is soluble in solvents that the protein is not. 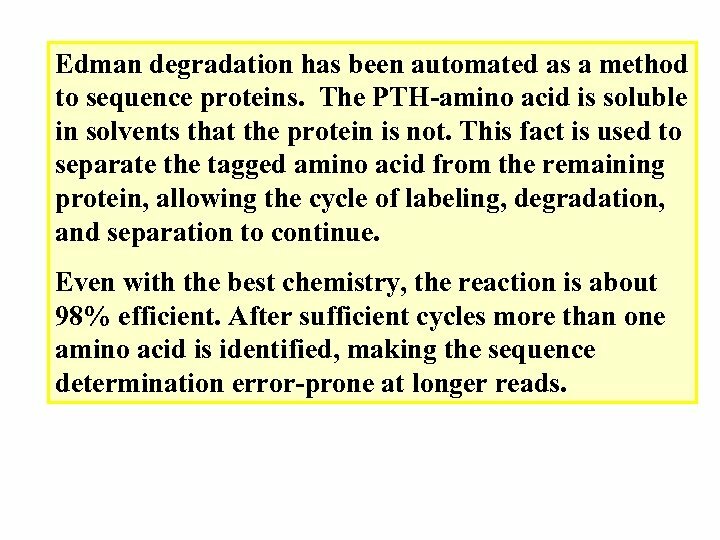 This fact is used to separate the tagged amino acid from the remaining protein, allowing the cycle of labeling, degradation, and separation to continue. Even with the best chemistry, the reaction is about 98% efficient. 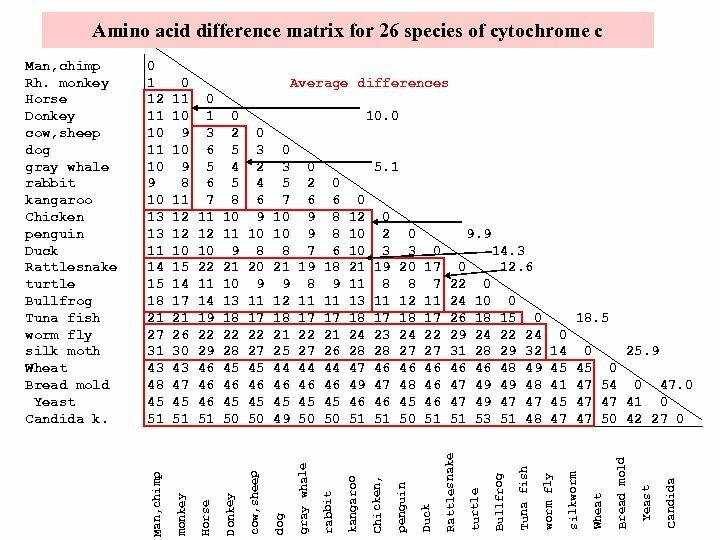 After sufficient cycles more than one amino acid is identified, making the sequence determination error-prone at longer reads. 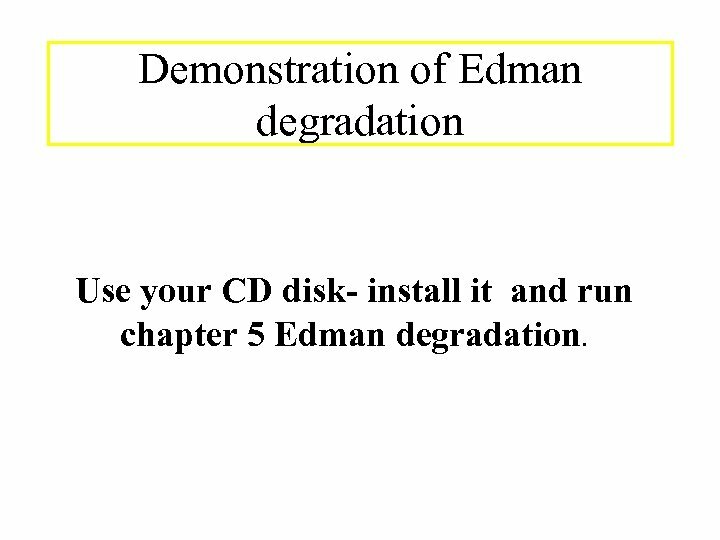 Demonstration of Edman degradation Use your CD disk- install it and run chapter 5 Edman degradation. 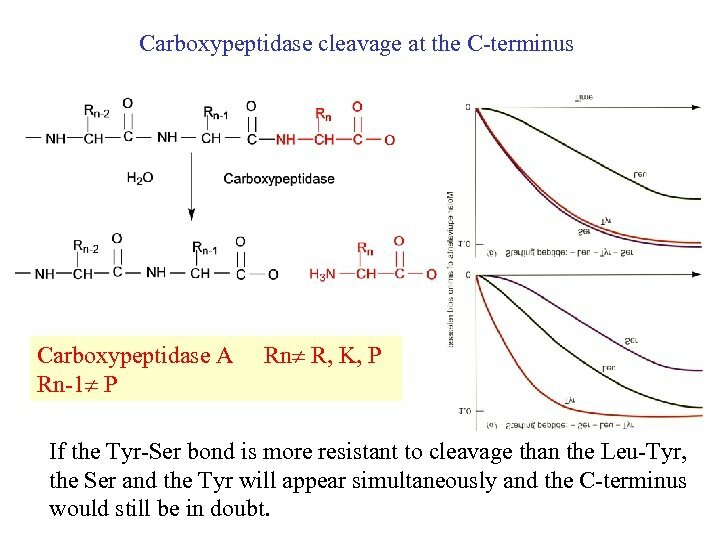 Carboxypeptidase cleavage at the C-terminus Carboxypeptidase A Rn-1 P Rn R, K, P If the Tyr-Ser bond is more resistant to cleavage than the Leu-Tyr, the Ser and the Tyr will appear simultaneously and the C-terminus would still be in doubt. 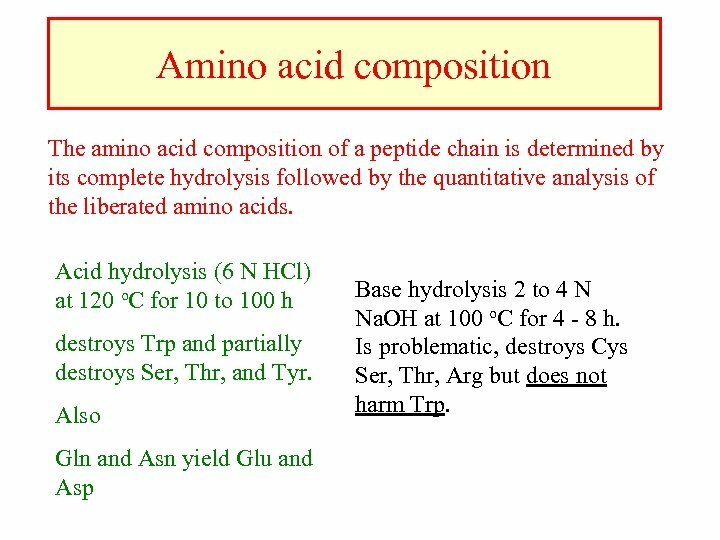 Amino acid composition The amino acid composition of a peptide chain is determined by its complete hydrolysis followed by the quantitative analysis of the liberated amino acids. Acid hydrolysis (6 N HCl) at 120 o. C for 10 to 100 h destroys Trp and partially destroys Ser, Thr, and Tyr. 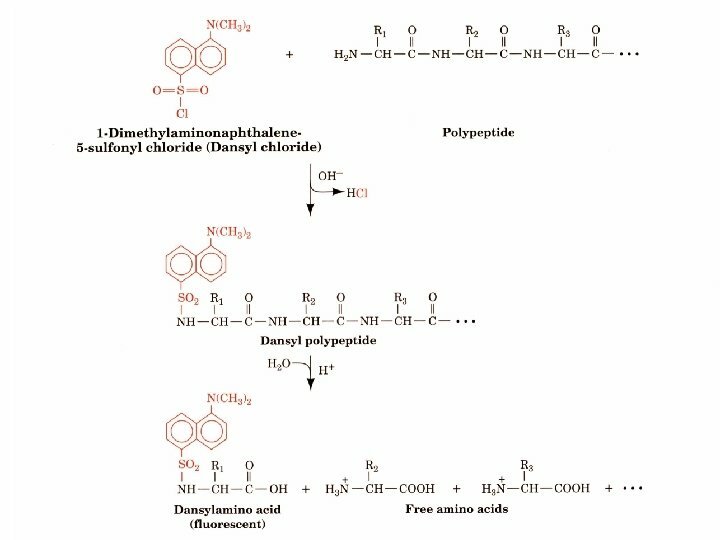 Also Gln and Asn yield Glu and Asp Base hydrolysis 2 to 4 N Na. OH at 100 o. C for 4 - 8 h. Is problematic, destroys Cys Ser, Thr, Arg but does not harm Trp. 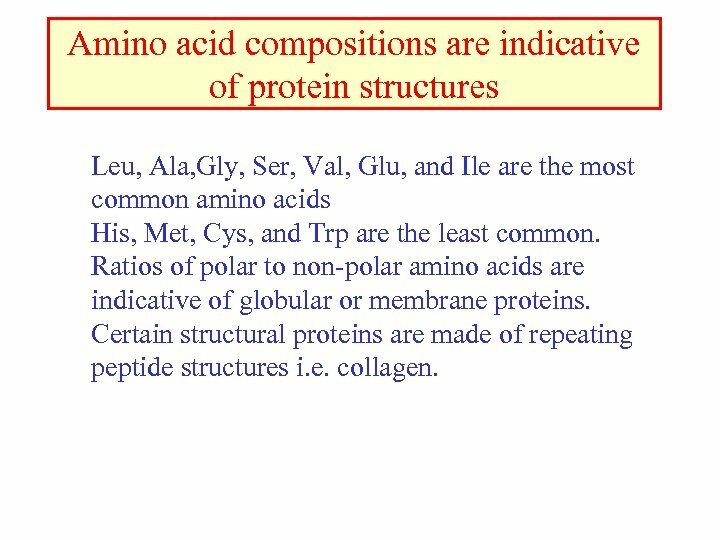 Amino acid compositions are indicative of protein structures Leu, Ala, Gly, Ser, Val, Glu, and Ile are the most common amino acids His, Met, Cys, and Trp are the least common. Ratios of polar to non-polar amino acids are indicative of globular or membrane proteins. 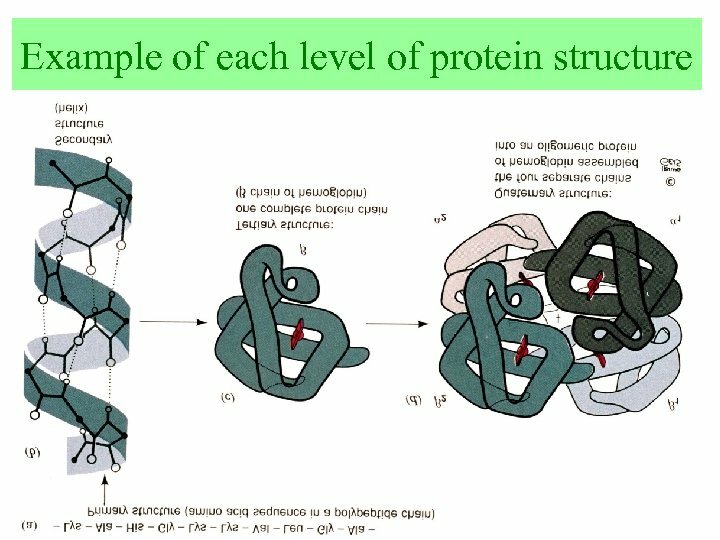 Certain structural proteins are made of repeating peptide structures i. e. collagen. 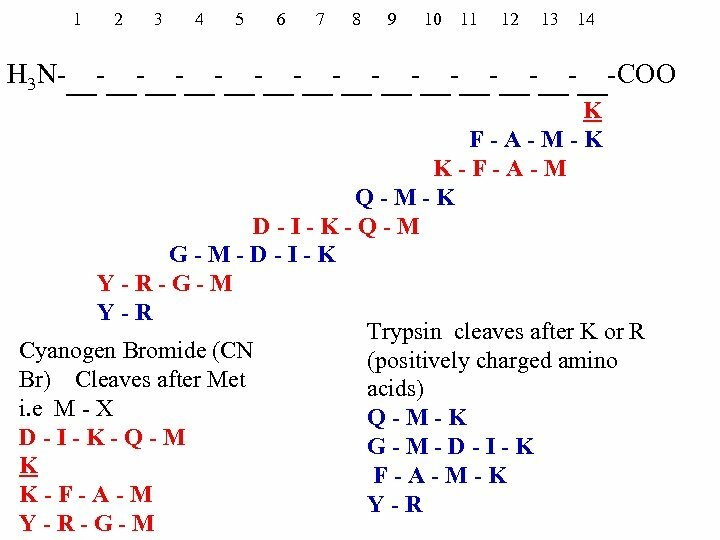 Specific chemical cleavage reagents Cyanogen Bromide Rn-1 = M Cleave the large protein using i. e trypsin, separate fragments and sequence all of them. 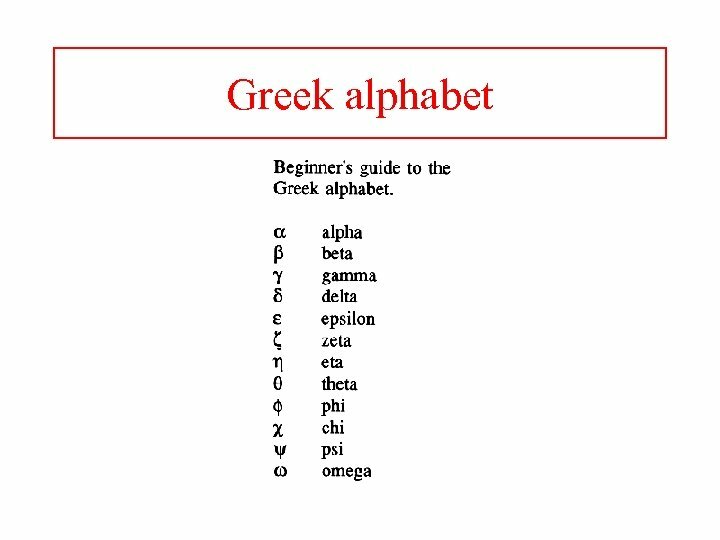 (We do not know the order of the fragments!!) 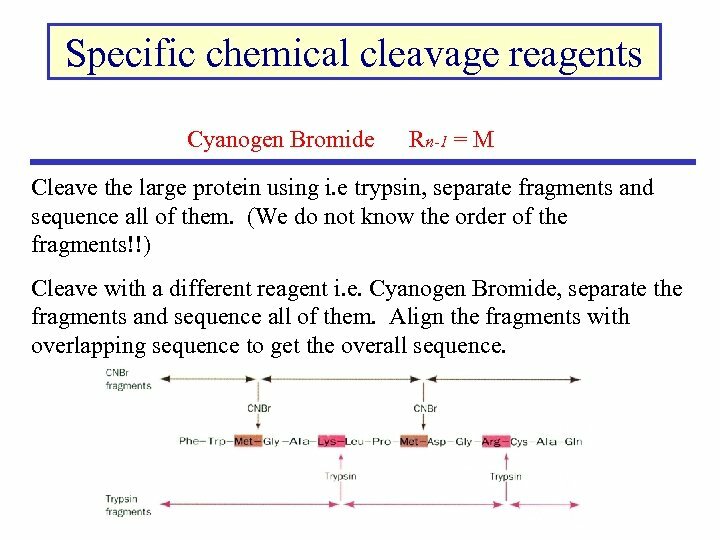 Cleave with a different reagent i. e. Cyanogen Bromide, separate the fragments and sequence all of them. Align the fragments with overlapping sequence to get the overall sequence. 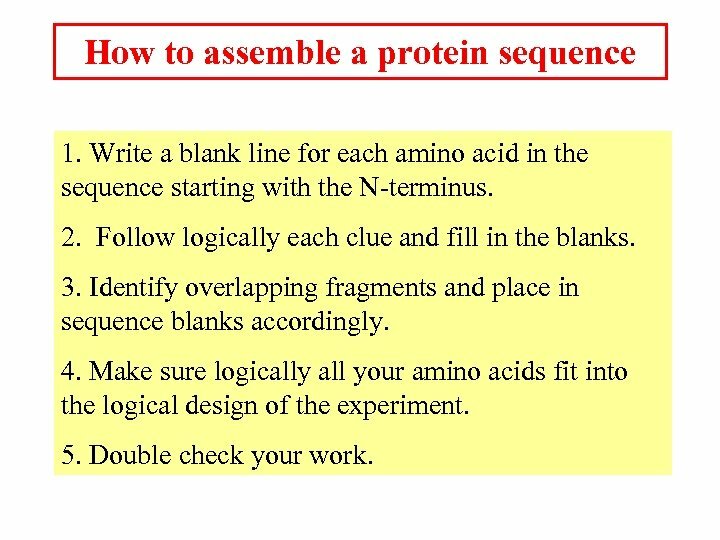 How to assemble a protein sequence 1. 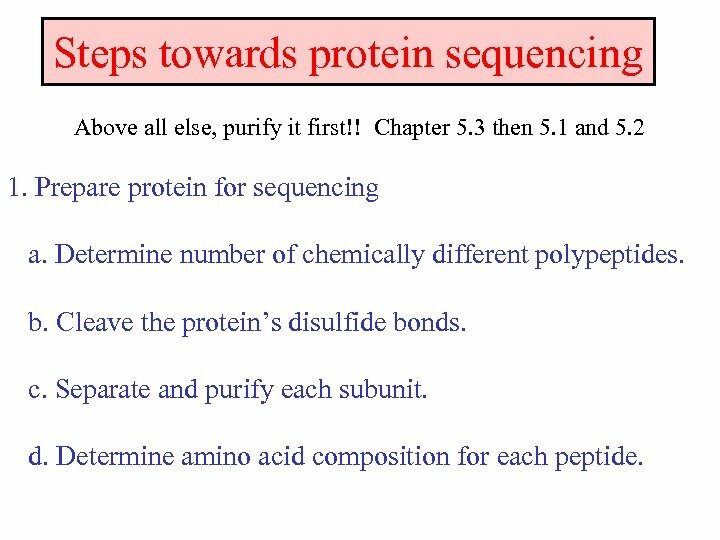 Write a blank line for each amino acid in the sequence starting with the N-terminus. 2. Follow logically each clue and fill in the blanks. 3. Identify overlapping fragments and place in sequence blanks accordingly. 4. 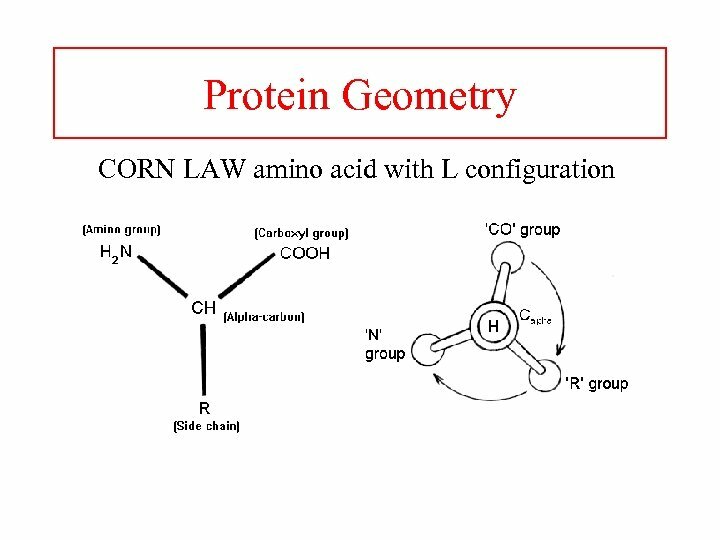 Make sure logically all your amino acids fit into the logical design of the experiment. 5. Double check your work. There a variety of ways to purify peptides All are based on the physical or chemical properties of the protein. 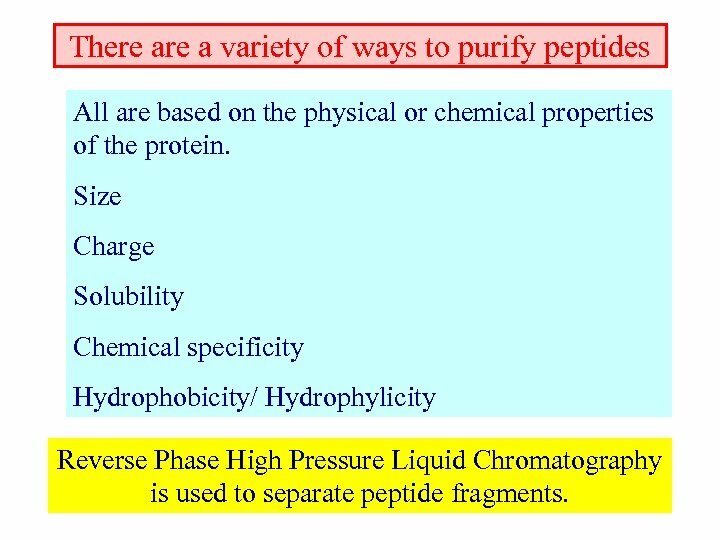 Size Charge Solubility Chemical specificity Hydrophobicity/ Hydrophylicity Reverse Phase High Pressure Liquid Chromatography is used to separate peptide fragments. 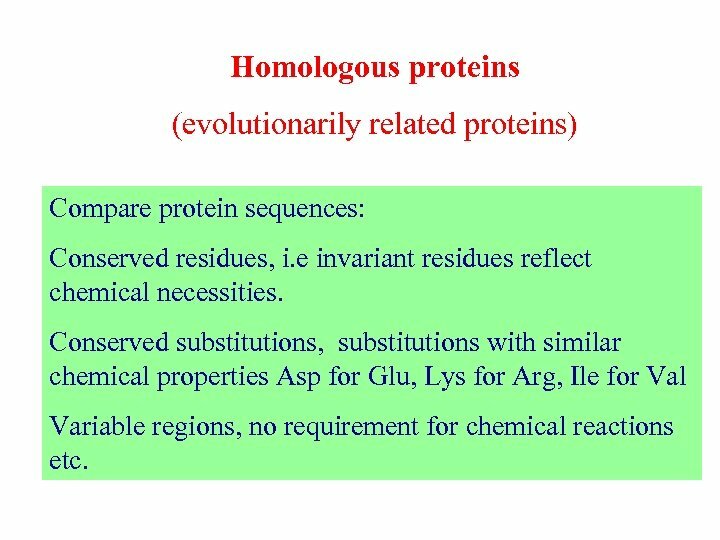 Homologous proteins (evolutionarily related proteins) Compare protein sequences: Conserved residues, i. e invariant residues reflect chemical necessities. 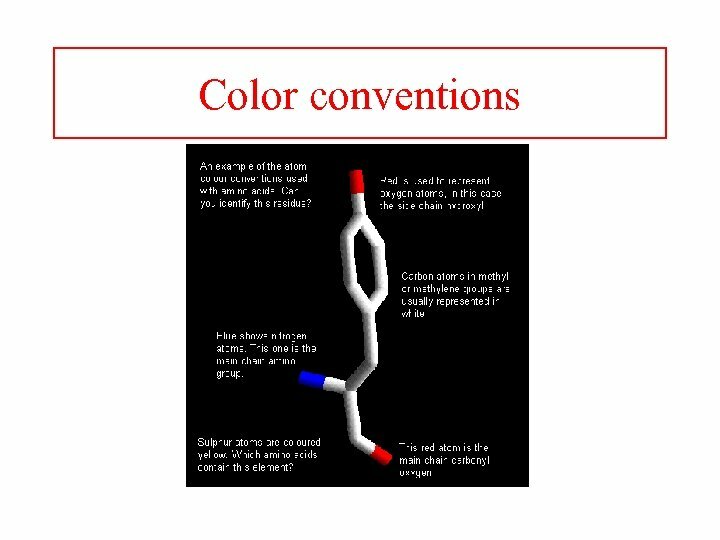 Conserved substitutions, substitutions with similar chemical properties Asp for Glu, Lys for Arg, Ile for Val Variable regions, no requirement for chemical reactions etc. 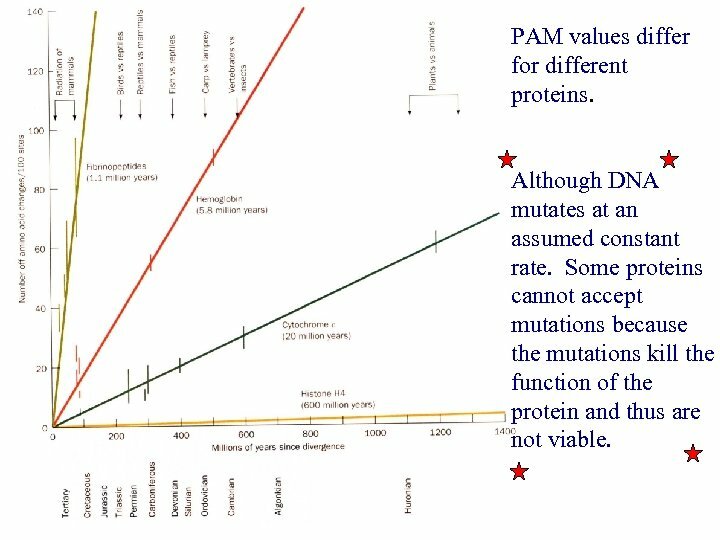 PAM values differ for different proteins. 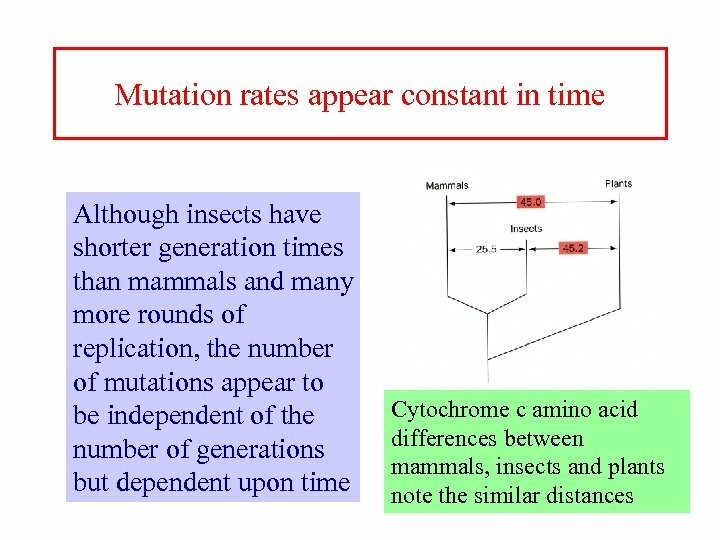 Although DNA mutates at an assumed constant rate. 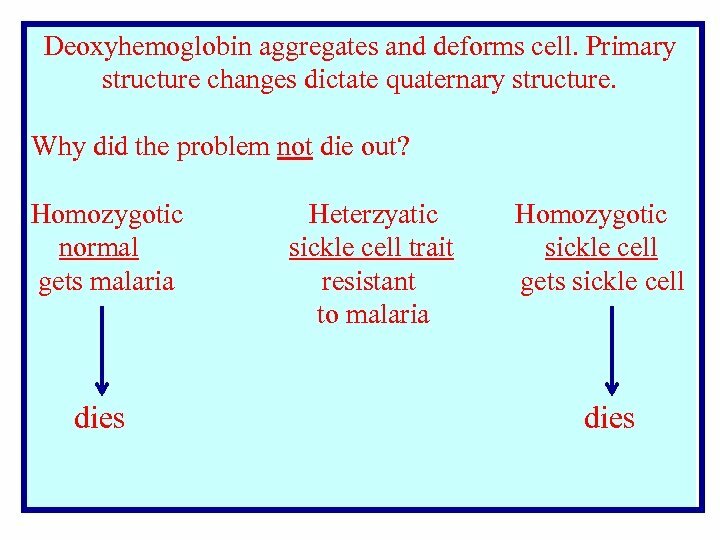 Some proteins cannot accept mutations because the mutations kill the function of the protein and thus are not viable. 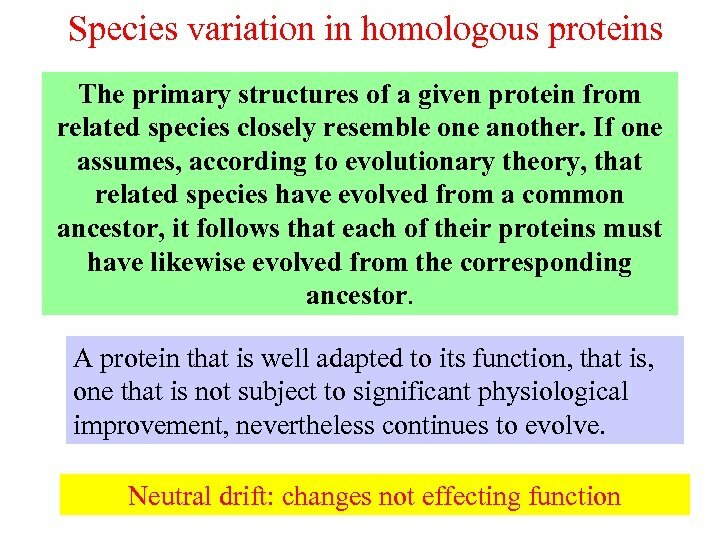 Evolution through gene duplication Many proteins within an organism have sequence similarities with other proteins. 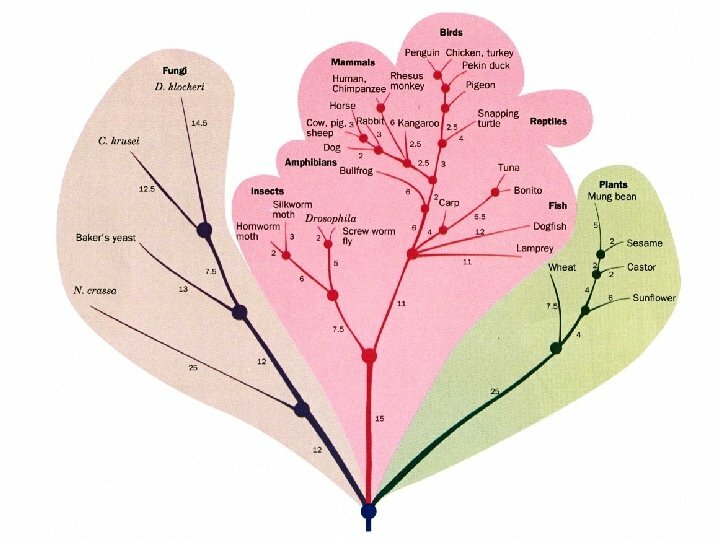 • These are called gene or protein families. • The relatedness among members of a family can vary greatly. 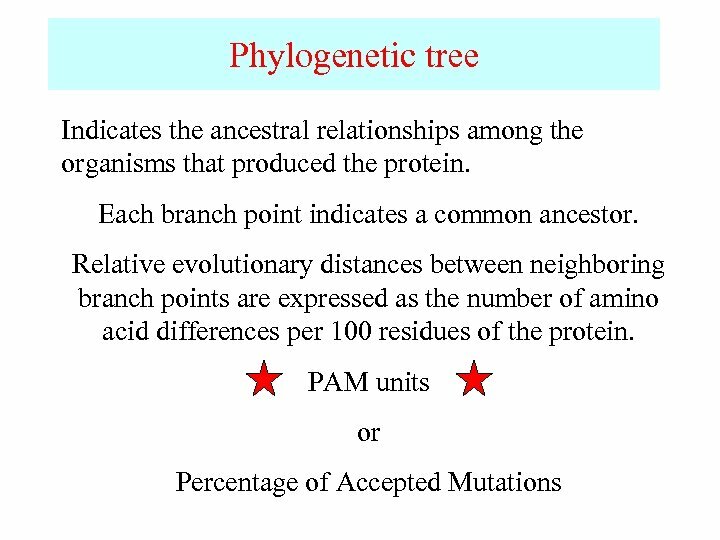 • These families arise by gene duplication. • Once duplicated, individual genes can mutate into separate genes. 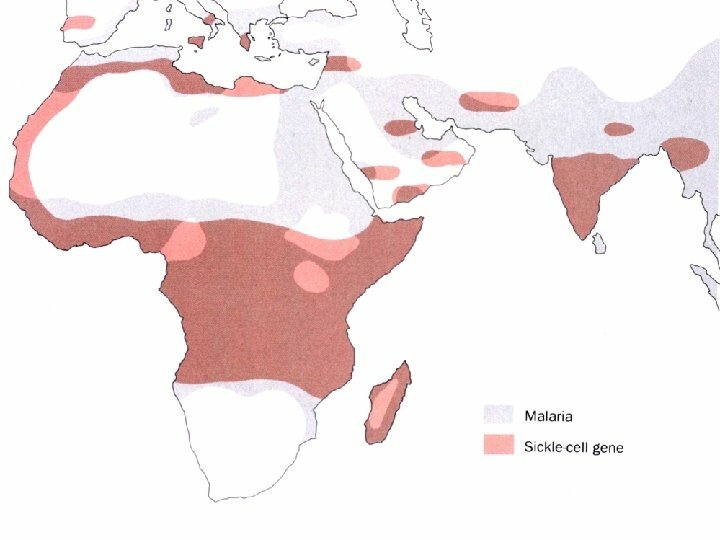 • Duplicated genes may vary in their chemical properties due to mutations. 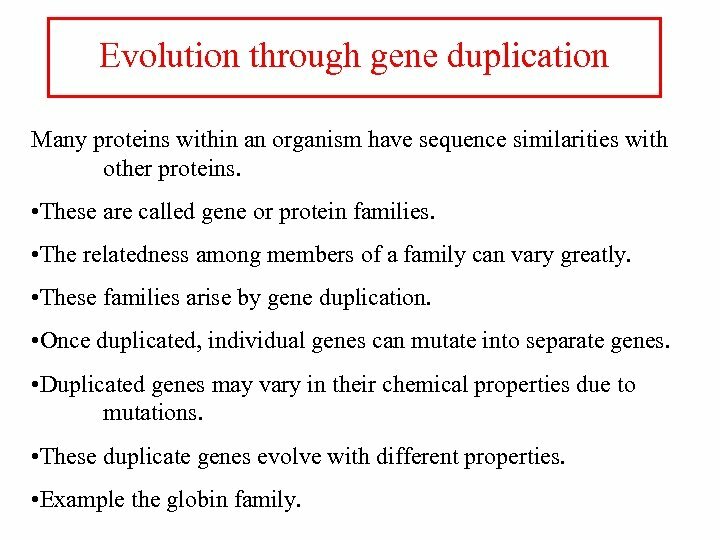 • These duplicate genes evolve with different properties. 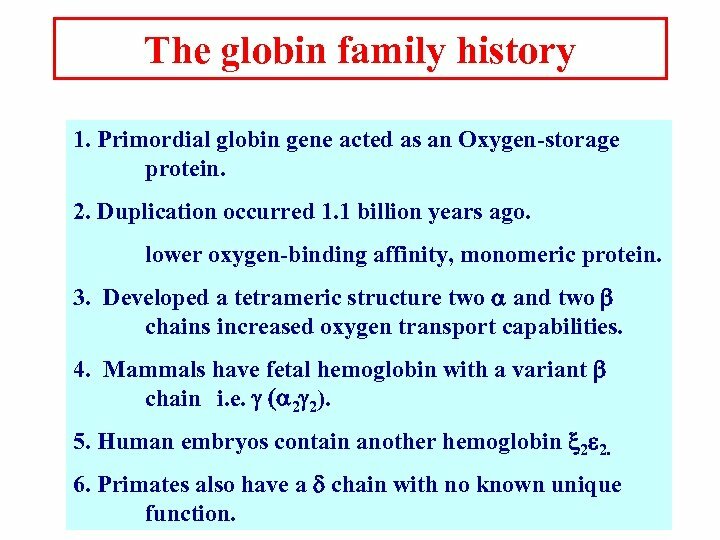 • Example the globin family. The globin family history 1. 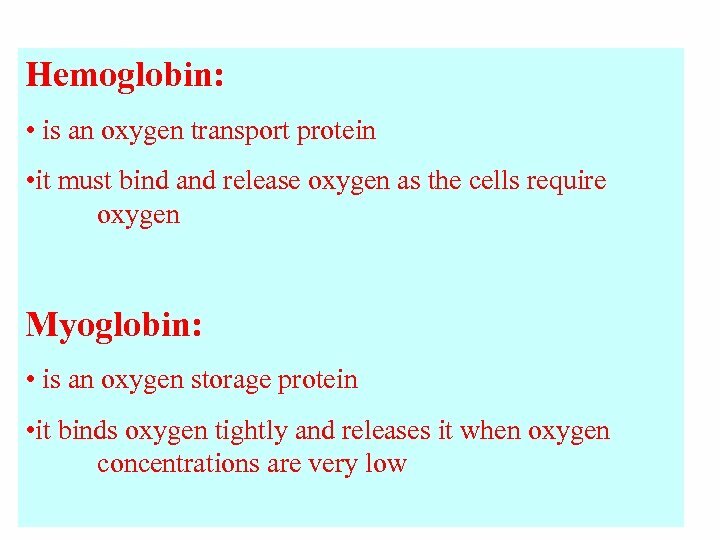 Primordial globin gene acted as an Oxygen-storage protein. 2. Duplication occurred 1. 1 billion years ago. lower oxygen-binding affinity, monomeric protein. 3. Developed a tetrameric structure two a and two b chains increased oxygen transport capabilities. 4. 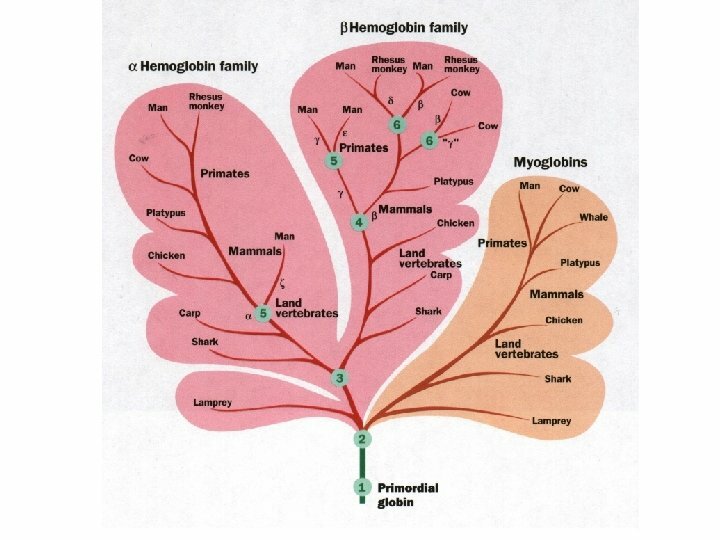 Mammals have fetal hemoglobin with a variant b chain i. e. g (a 2 g 2). 5. 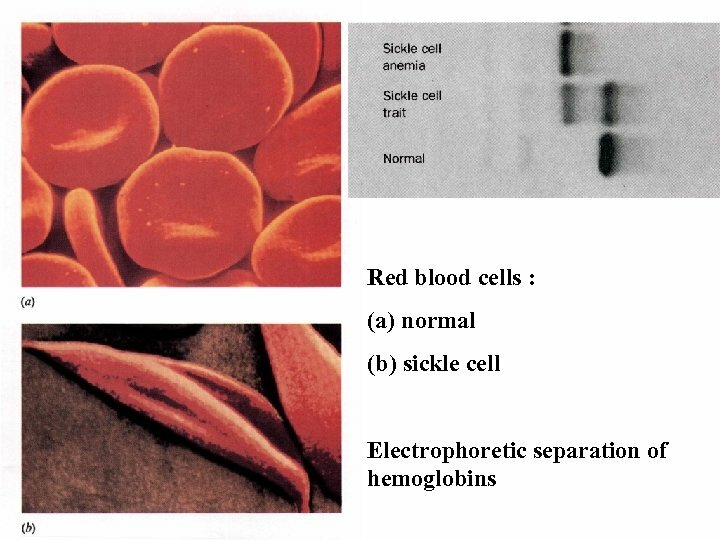 Human embryos contain another hemoglobin 2 e 2. 6. Primates also have a d chain with no known unique function. 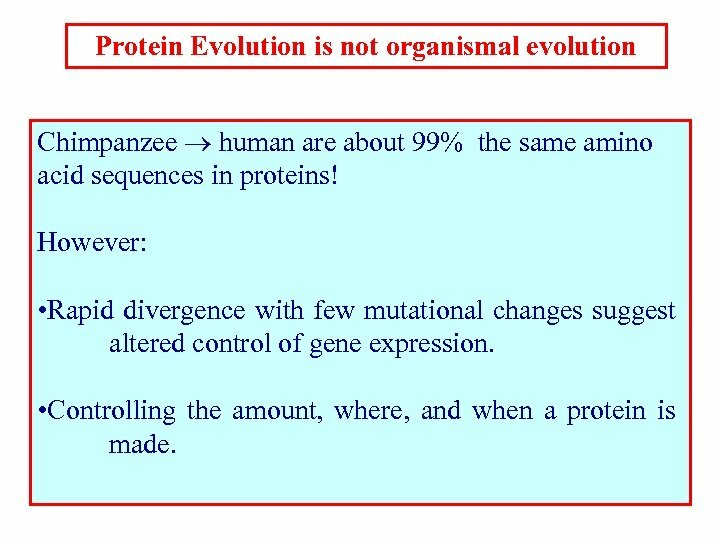 Protein Evolution is not organismal evolution Chimpanzee human are about 99% the same amino acid sequences in proteins! However: • Rapid divergence with few mutational changes suggest altered control of gene expression. 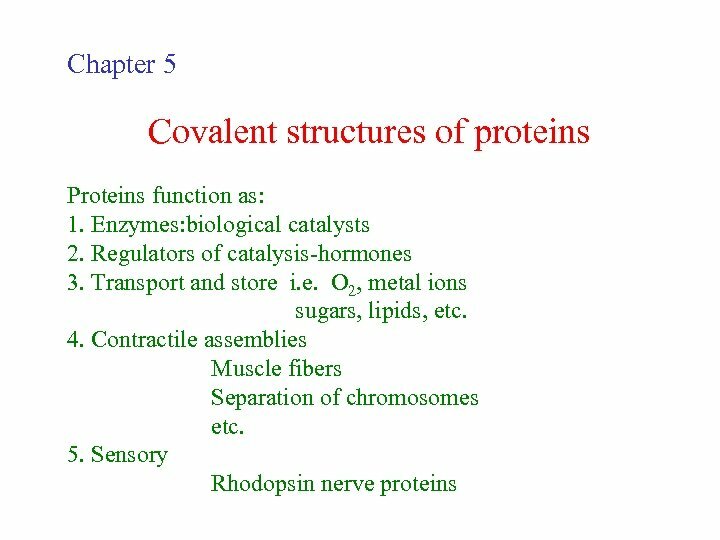 • Controlling the amount, where, and when a protein is made.